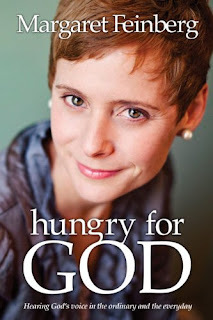 Hungry for God by Margaret Feinberg is a book not on how to become a Christian but on how to Be one. The book takes the reader through the steps of hearing God, to communicating with him, and drawing on that hunger and stirring for more of Him. He wants us to ready ourselves for hearing from Him through scripture, liturgy, our thoughts and visions. Journaling can be a spiritual use of communicating with God as you share your dreams and circumstances. God speaks through our conscience and the counsel of others as well. This is a great book for new believers in how to draw near to God and hear Him. It would also make a great book study book for those searching for a closer connection and hunger for God. There are reflection and discussion questions included for a small group or book club setting. The one thing I did not like with the book was the cover. At first site it appears to be a biography of Margaret Feinberg rather than a study on the hunger for God. I would recommend that authors not plaster their own likeness on the front of a book that is focusing on knowing God better, it seems prideful to me. The content is great if you can get past the cover. I received a complimentary copy of this book for an honest review from Zondervan.